Two-photon microscopy images obtained with the triphenylamine derivatives described in the pattent. The invention relates to novel triphenylamine derivatives for use as fluorophores, in particular for two-photon microscopy in biology. 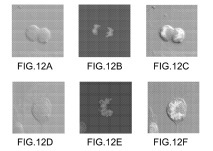 It also relates to compositions containing these derivatives, to the use of these compositions and also the derivatives themselves for labelling biological molecules (or 'biomolecules') such as nucleic acids, oligonucleotides, proteins, polypeptides, plasmids, etc., with a view to observing them in particular by two-photon microscopy, and to biomolecules labelled with said derivatives. Applications: biological and medical imaging (fundamental research for the structural or functional study of biological systems, applied research for clinical or therapeutic purposes, diagnosis and medical screening, etc. ).